Blair brings 30 years experience of silversmithing to Glen Echo Park as founder of SilverWorks Studio & Gallery and Studio 2: Hot metal. 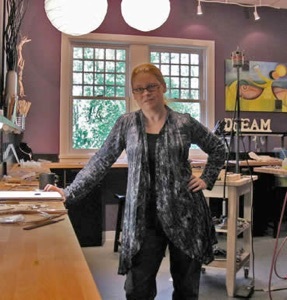 An award winning artist, represented by thirty+ galleries throughout North America, Blair has shown her work in one-woman shows as well as juried fine craft shows. Previous awards include a Canadian grant for The Works, a public installation of her framed wearable art and a NICHE award for her one-of-a-kind eyewear. 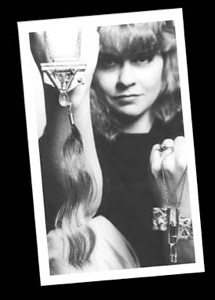 Following the trajectory as a metal artist she opened Blair Originals Gallery and founded the Wetaskiwin Silversmith Guild where she was the primary instructor. Taking silversmithing to a new level, Blair’s framed wearable art represents personal journeys by telling a story with metal and precious stones. These works are more than jewelry having a depth of content often dealing with themes of social justice, spiritual awareness, and women’s issues. Blair is married to her best friend, Bryan and they have one son, Daniel, an artist in San Francisco. Bryan and Blair live in Silver Spring, MD. Blair loves to introduce the art form to others by sharing her knowledge and her studio. 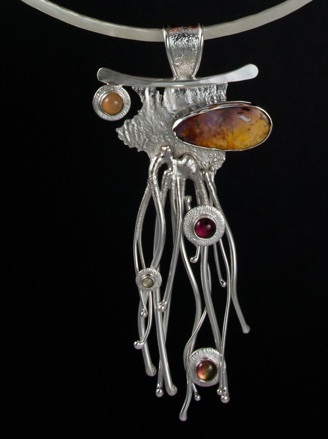 Classes are informal and fun and include basic silversmithing techniques, intermediate learning, and multiple exploritory techniques in this time honored craft. Stop by and view an ongoing show of her works at Silverworks Studio and Gallery open to the public. ...and many more over the years. 5 Years of SilverWorks: A Celebration of Techniques.